A few weeks ago I shared how to make my Chickpea of the Sea Salad Sandwich recipe and it was such a hit! I loved seeing all of your sandwich pictures on Instagram and Facebook and some of you even gave this recipe a twist with your own variations that looked delicious! This is one of my absolute favorite sandwich recipes and I love that you love it too! I was then inspired to create another version of this recipe using simple, healthy ingredients. In today’s cooking video and blog post I am sharing how to make an Avocado Chickpea Sandwich also known as a “Cranberry Walnut Chickpea Salad Sandwich”. Whatever you prefer to call it, it’s delicious! This recipe uses avocado as a creamy “glue” if you will, to hold everything together. If you plan to make this recipe ahead of time, add in a little fresh lemon juice to keep your avocado from browning. A great plant-based lunch or light dinner! 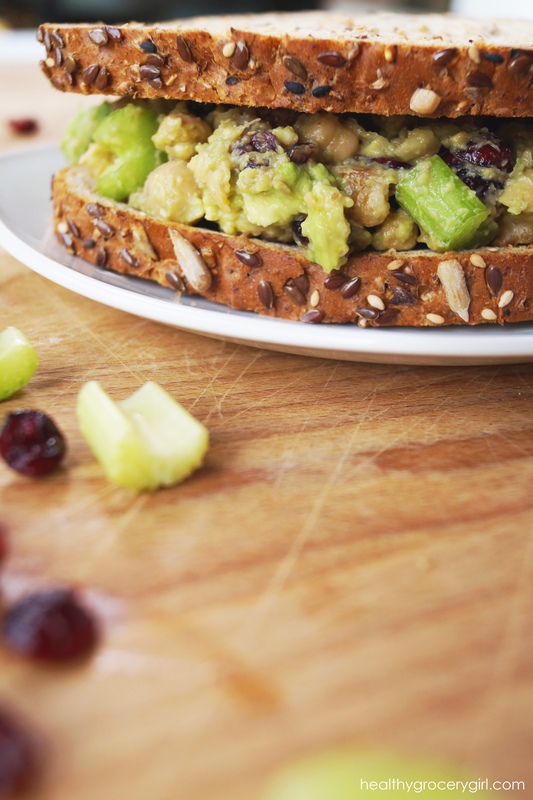 Place avocado chickpea salads on toasted bread, top with the other slice of bread and… you have a sandwich! A delicious sandwich. Boost nutrition in this meal by adding lettuce onto your sandwich or add a side salad!